Buca di Beppo: Register for their eClub updates and receive a free pasta on your next visit, and a $20 birthday gift. California Pizza Kitchen: Sign up for their Pizza Dough Rewards and get a free dessert during your birthday month. Captain D’s Seafood Kitchen: Become a Captain D’s Seafood Restaurant Insider and receive a free dessert once a week for a month with the purchase of a regular-priced meal, plus more freebies on your birthday. Denny’s: Present your valid I.D. to receive a free Grand Slam on your birthday (includes two eggs, two slices of bacon, two sausage links and two pancakes). Famous Dave’s: Join the Famous Nation Club and receive something free on your birthday. Flat Top Stir-Fry Grill: Join their eClub and get a free treat on your birthday. Houlihan’s: Join their email club and $10 off for joining, plus a free entrée on your birthday. P.F. Chang’s: Sign up for their email updates and get a free dessert or appetizer on your birthday. Friendly’s: Join their BFF Club and get 25% off on your next visit just for enrolling, plus a free sundae on your birthday. Dairy Queen: Join their fan club and receive a coupon for a free ice cream treat on your birthday. Moe’s Southwest Grill: Join their eClub and receive a free burrito on your birthday. 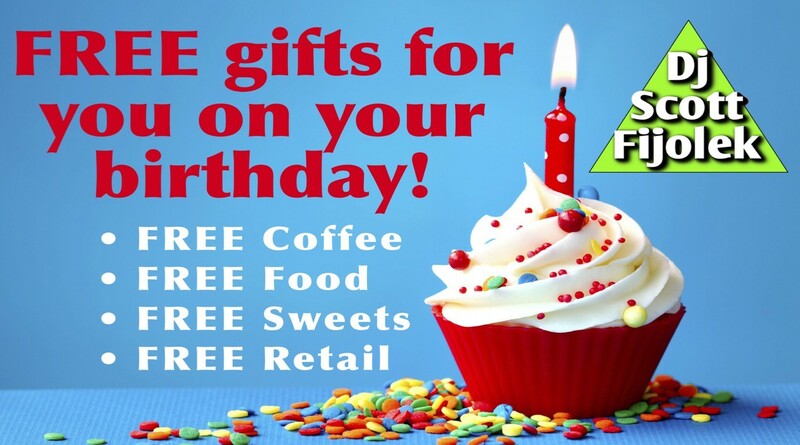 Sonic Drive-In: Sign up for their Birthday Club and you’ll receive a free surprise on your birthday.